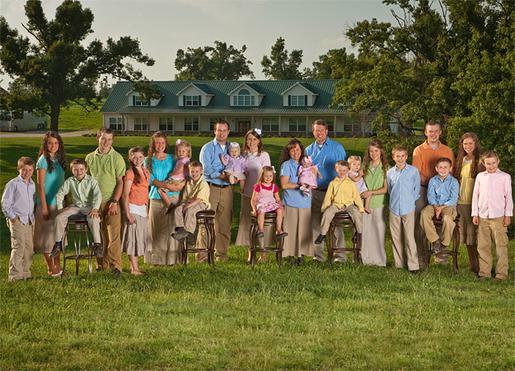 By now, I’m pretty sure that most people have heard of the Duggar family and their show on TLC. Well, maybe not everyone knows them by name, but surely they have heard of the woman who has given birth to 19 kids. If you haven’t heard of them, then boy do I have a treat for you! Of course, there are many in my homeschool community who are not really jazzed by the Duggars, and there are some that flat-out dislike the whole show. I, however, am not one of those people, for the Duggars changed my life and I would love to tell you how. Just in case you are emerging from the same rock that I was under six months ago, before I discovered the Duggar show, let me give you a little history. This boy met this girl and knew in his heart that she was the one, but in his shyness, didn’t speak to her for a great while, until one day she started working in a shop that his mom managed. Boy asked girl out, they started dating, fell in love, got married, waited a couple of years, had a child, went on birth control, had a miscarriage and were told that it was highly likely that the birth control pills were what had caused it. Now, although it is a horrible occurrence, it is pretty common, as most people have either had it happen to them or they have known someone that it has happened to. The difference here is that Jim Bob and Michelle, who are extremely devoted Christians, felt that by trying to plan out their life on their time instead of God’s time, caused them to lose their child. So, Michelle never took birth control pills again, she and Jim Bob made a vow to let God decide how many children to give them, and now they have 19. Sure, most parents would have pulled their hair out after the third, or the seventh, or the thirteenth, but I challenge you to watch the show and see for yourselves that these two parents have all their hair still firmly on their head. Now, these 19 kids are pretty cool too. Josh, the oldest is married to Anna (who is adorable), and they have a baby named Mackynzie (who is even more adorable). Then there’s Jana and John David who are twins, Jill, Jessa, Jinger, Joseph, Josiah, Joy Anna, Jedidiah and Jerimiah who are another set of twins, Jason, James, Justin, Jackson, Johannah, Jennifer, Jordyn, and Josie. They have all been, will be, or are still being homeschooled. The family hardly watches any television, their internet is closely monitored, they court instead of date, wear modest clothing, do not have any debt whatsoever, and live their lives on Biblical principles. I love them all, because they are full of personality, they are not afraid to voice their opinions, and they are not ashamed of their Christian values. After seeing most of today’s youth, what’s not to like? Alright, I’m done with the run down of the show, now let’s get down to my point. I have been a Christian my whole life. I accepted Jesus Christ as my savior when I was seven. I talked to God all the time, I prayed about most everything, and I knew that He had my back. I tried very hard to raise my children to know and love God as well, and my husband and I tried to live a life that would honor Him. Yet, something was missing. I had finally read the Bible a few years back, from cover to cover, so I knew that we weren’t really doing what we were supposed to. I was yearning for a more spiritual and meaningful life, sort of like on the Little House on the Prairie show that the kids and I watched constantly, but I figured that in this day and age, that type of lifestyle was antiquated. I started digging deeper. I visited their website http://www.duggarfamily.com and read about their beliefs. After devouring all the information on the site, I went to the library and checked out their book, The Duggars: 20 and Counting! by Michelle and Jim Bob Duggar, and found out the why, where and how of their journey so far. Their words comforted me, their ideas inspired me, and the Lord worked through them, which is what I think they had hoped for all along when they decided to do the show. My husband and kids started to notice little changes in me, like I didn’t swear and cuss very often anymore (I am sorry to say that my language was not always pleasing). I stopped trying to run the show at home (yep, more bad news, my husband couldn’t be the man of the house, because I wouldn’t get out of the way). I started talking to my kids…….alot. I was anxious to get to know them better, realizing that although I took care of their physical and emotional needs, it was important to discover their spiritual needs too. My husband and I were working together as a parental team, unlike we ever had before, and we were becoming more unified as a married couple. The family as a whole, stopped watching so much television (I know, ironic, as it was a t.v. show that caused all this), and started talking instead. Any t.v. that we did watch seemed harsh in comparison now. We could no longer turn a blind eye to the violence, sexual content, and foul language of the many shows, movies and video games that we used to love. Things were different somehow and we could not go back, almost as if someone had lifted a veil, disclosing the dangers of what we had once deemed innocent. Trust me when I say, however, that the kids did not go down without a fight…….sort of. Even my husband was slightly wary of the changes that the Duggar show had caused. He wondered if Jim Bob was for real, after all, who can be that steadfast and sturdy? The kids wanted to know if perhaps Michelle was on medication, for she was so calm and serene with her children (and where their own mother could get a prescription, no doubt). Even I was beginning to look for the flaws, thinking it impossible that one family could have gotten it so right. But slowly, then steadily, we started applying these values to our own lives. One thing would take hold, and we would move on to the next thing in our life that needed changing. Some things stung a little, like the no dating rule for my son (courting is a topic that I will discuss later), and the no tank tops or short-shorts for my daughter (and modesty is another topic), but they soon came to realize the importance of these things. Others were warmly welcomed, like the more time spent together, the nightly Bible discussions (and yet just one more topic) and the daily Proverbs reading. Of course, we are still working on the calmness and serenity, but cut us some slack, we do have teenagers!